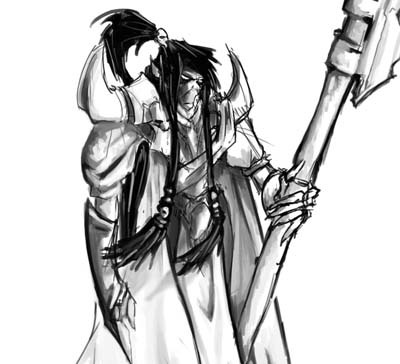 I've been working on a commission for a rather extensively converted Dark Eldar Archon model over the past month or so. Time to share some of my progress with you all. This is the sketch I was sent. It comes from somewhere and was drawn by someone and I wish I knew who so I could give credit, but I don't. Nonetheless, this is what I received along with the question, "Can you build this?" That's not what happened exactly, but my memory fails me and that sounds like a really good story. After some back and forth emails, I figured I could do it having no previous experience with Dark Eldar (other than playing against them once a few years ago). What could go wrong? 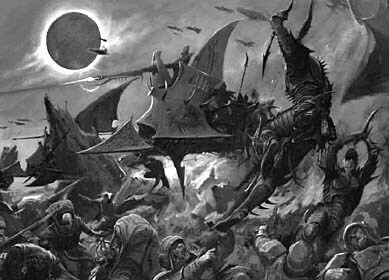 So I did my usual research which involves lots surfing for all the Dark Eldar imagery I can find and then hounding my Client for all the information he has and figuring out exactly what he wants the model to look like. This can drag on for days. Actually, I am fortunate that my Client knew exactly what he was looking for. It was just a matter of getting there. So we started down the path together, my Client and myself, both hoping to build a Dark Eldr Archon model unlike any other out there to put the finishing touch on his army. It's been quite a ride, this conversion. And it's not done yet, but by the time I get you all to speed, I should be close. Would you believe the the finished model looks exactly like the sketch... almost. Certainly looks like a very interesting challenge, very cool artwork to draw inspiration from as well! Can't wait to see what you've done! Your work is always really clean and I'm betting this mini will look just as good. Very dark and sinister... can't wait to see the mini. can not wait to see it, I dont have a lot of experince with the DE either so I imagine it would be a hard job.